A quick note: For another home automation trick and those interested in finding out about the earlier Twillio callbox+TV popup/notification hack check out STEM (https://github.com/ericblue/STEM). Certain models of Samsung TVs allow popups for incoming phone calls for Samsung phones, but this can be extended to support any situation through the API. Last year when I first got my Belkin WeMo switches I was disappointed to see there was no API out there yet. And, given my goto language for quick ‘hacks’ is Perl I decided to reverse engineer how it works. Luckily it’s based on UPNP (Universal Plug n’ Play) and didn’t take too much work to figure out how to search for switches and sensors, and send commands to toggle electrical outlets on and off. The code has been available on GitHub for some time, and I just recently uploaded to CPAN to make distribution and inclusion easier. Find a computer located on the same network as your Belkin Devices. Ensure your firewall/router can open up port 9000 (default) and map to your computer. Check out the Perl Belkin Wemo API from CPAN (v1.0 as of this writing) for the latest stable version, or Github for the latest developments. Download the SMS server example at https://github.com/ericblue/Belkin-WeMo-Twilio-Server. The commands, your cell number, and the names of your switches should be changed. You can launch the server (launch.sh) or in debug mode. Going to http://your_internal_ip:9000/ should show a simple text welcome message. Register a new number and define the messaging request url as ‘http://your_public_ip:9000/sms/ and POST. 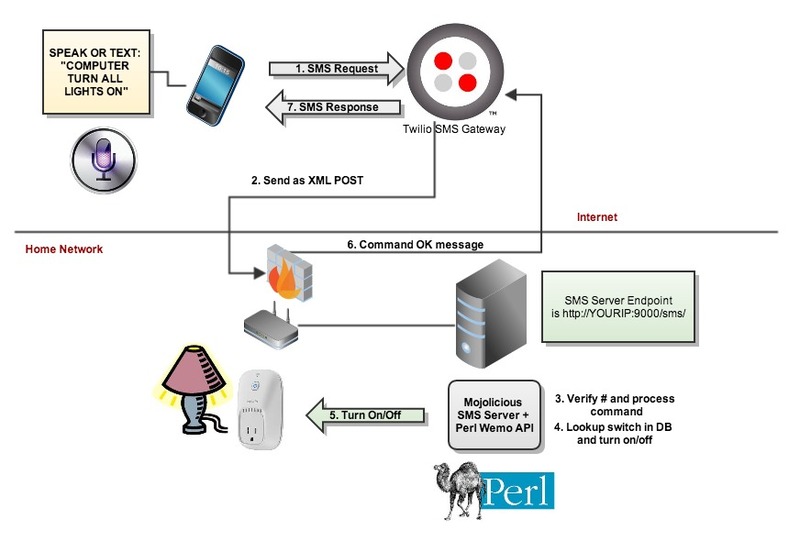 Port 9000 is the default port, and should be mapped in your firewall from your public IP to internal IP of your SMS server. If you look at the sms_server.pl file you can see it’s a VERY simple and crude processor for some basic commands and translates words such as ‘upstairs’ and ‘downstairs’ to specific devices. This was created very quickly, so to customize you could modify to suit your needs or add something more sophisticated like a rule processor or XML-based config for mapping commands and devices. That’s it! I hope you enjoyed this relatively simple hack and have fun!